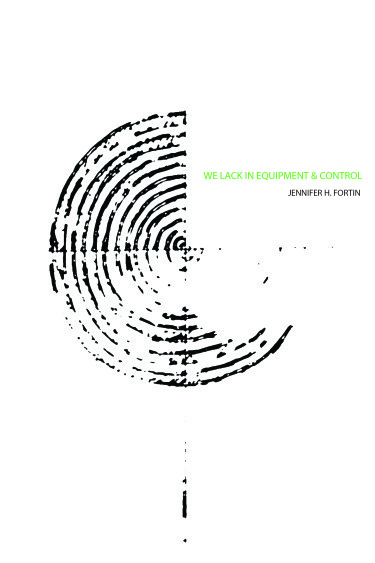 We lack in equipment and control is Jennifer Fortin’s second book. The first book was ‘Mined Muzzle Velocity’ which was published by Lowbrow press in 2011. She has a chapbook called ‘Give or take’ which was published by Greying Ghost Press. I will not address any themes to prior books as outside the scope of this review, but if there is one word that I could use to describe her poetry, the word would be ambitious. The poet Darcie Dennigan prepares us for Fortin’s work by asking us to step up to the plate. She says, “She gives us poems of scraps and details and lets us make something—big and vital—from her materials.” I think that’s a fair call to action. Fortin’s poems are an attempt to push the reader forward in time. The poem tantalizes us with its fragments. Tiny verbal fractals that are layered like Matruschka dolls and peeling one does not lead us closer to a finish, it just reveals another lyrical fragment crouched like a cat. But this is a good thing, it is inspired poetry at its best. Fortin’s poetry is a meditation on the things that make us human. The poems keep reminding us that perfection is illusory and lack is the normal state of things. I love these little interludes. They are intricate and filled with wisdom. The poems are peppered with a wryness that I associate with experience, and one can imagine an older actor like Bill Murray reading them aloud in my head. These poems play around with the nature of time and imagination. They are certain bold leaps taken and some hastily withdrawn but the dance enchants us and there is not a single missed beat. My first impression after reading this particular bit was disappointment. The fragment suspiciously comes close to the platitude of human life being a meaningless speck in the grand scheme of things. But at a closer look, it makes a case for disorientation and why the weird is a perennial source for an alternate worldview. Fontin challenges us to embrace that which we cannot cohere in our narratives. She is a careful observer of human nature and here she is teaching you to observe. These little gems are what make this challenging set of poems worthwhile. There is a relaxed vibe in her poetry. There is no sense of urgency. The first cycle of poems is called ‘of environmental concern’ and it is the only section where I felt the pacing was hurried. Her observations on nature are poignant and wistful. There is an undercurrent of hope throughout this cycle of poems. Standouts for me were ‘The Awl Responsible’, ‘We weren’t sure’, and ‘Call me placed like accident’. The last one in the set is particularly memorable. It is the penultimate poem in the first set and it is woven beautifully. The second cycle is called ‘that which just gets tired & then kind’, if the title sounds like a precious bit of non-sequitur then the poems turn out to be the opposite. Quirk can be good at times and from Fontin’s poetry I came away with a refreshing attitude of all things quirky. If there was one common strand running throughout the poems it would be the need to keep refreshing our ideas and prejudices and the biases that tag along with them. Never assume things at face value. Perspective matters, individuality matters and what we bring to life, our own set of beliefs and our reasons for supporting them is what makes it worth the ride. We may lack in equipment and control but far from being a failing, it is this lack that makes life bearable. The book can be purchased from H_NGM_N books.